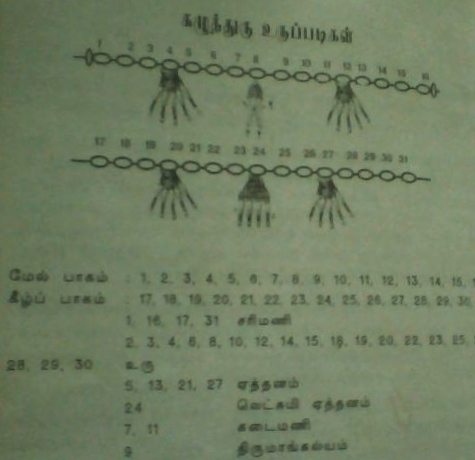 This is the ornament specially for nagarathars(a caste in karaikudi). "Thiru" literally means lakshmi.Mangalyam(ornament used for marriage) will be in centre of kaluthu(the tamil word for neck).so the name given is" kaluthiru".This is the ornament worn to bride by the bridegroom during marriage.There was a tradition of keeping "rudraksham" in middle of "kaluthiru".Taking the kaluthiru from the bride house the day before the marriage is a tradition.The pangalis will make the "kaluthiru". There are totally 31 parts in kaluthiru excluding "kuchi","thumbu","orraithumbu","thuvalai"
we need 31 parts,thread,turmeric.Take the thread.Make 21 divisions in the thread.fold it thrice.Now we will get 7 divisions.spin it to make it as a chain.soak the turmeric in the water.rinse the thread in that water.spin thoroughly to make it stronger.The thread now appears yellow in colour.now take 31 parts of kaluthiru and connect it to the thread.Now the famous chettinad ornament is ready to worn by the bride. copyright@karaikudiweb. Simple theme. Powered by Blogger.